Green Class have been making good phonic progress as we continue our preparation ahead of class reading. The aim is to provide all pupils with an understanding of the sounds that individual letters can make, as well as introducing letter blending that will help us with our reading skills. The Green Class children have been playing various games on the class whiteboard to help us with our phonic work. The pupils have taken it in turns to sound out a large letter that appears on the screen. It is equally important at this early stage to match up the letter sound with the signing action. Each class member is then invited to draw out the letter formation on the whiteboard. We then think of a word that starts with this letter, before finishing with sounding out the complete word. We have been using these phonic skills to help the children appreciate our current class reading book The Cat Sat on the Mat. The story contains many new sounds. Green Class are asked to sound out the new phonics that we have learnt whenever they hear them. Walking Through the Jungle is another popular current reading book in Green Class. We have been using the many sounds made by each animal to help with our phonic learning. All of this phonic learning is then continued during individual class table time. 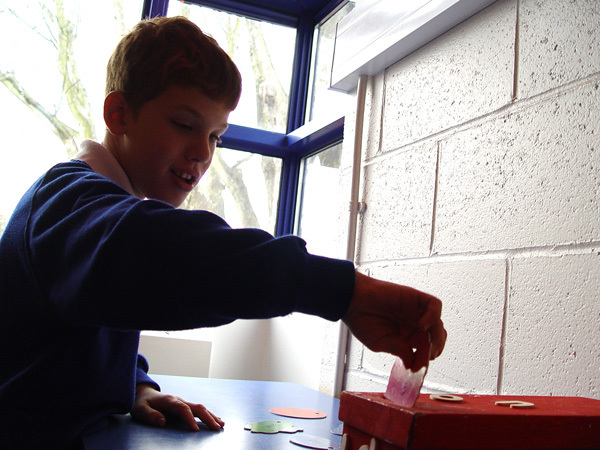 A number of related activities are set up for each class member aimed towards meeting their own learning target. An example is the letter posting game. Some wooden shapes showing different animals or objects are placed on the table. The task here is to identify what we can see, sound and sign out the word, and then post it away.